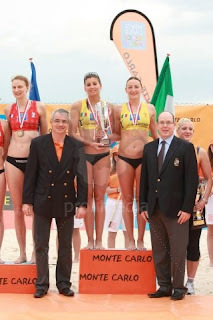 There are many duties, heavy responsibilities and alot of work that goes with being the Sovereign Prince of Monaco, but Prince Albert II also gets to be very well off, travel the world, go to lavish parties, rule his own countries and give awards to women beach volley ball players. That is what went on last Sunday when the Prince decorated the winners of the third beach volleyball tournament for women in Monaco. It was the Italian team which came out on top and were presented with medals and trophies for their victory. It's a tough job, a life of sacrifice, but someone's got to do it and Monaco's monarch is there for all of us to get it done.